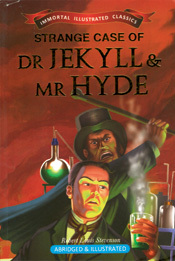 The Strange Case of Dr Jekyll and Mr Hyde is about a London lawyer named Gabriel John Utterson who investigates strange occurances between his old friend, Dr Henry Jekyll, and the evil Edward Hyde. The tale describes a sinister figure named Mr. Hyde who tramples a young girl, disappers into a door on the street, and re-emerges to pay off her relatives with 10 pounds in gold and a cheque signed by respectable gentleman Dr.Henry Jekyll (a client and friend of Utterson’s)for 90 pounds. Jekyll having recently and suddenly changed his will to make Hyde beneficiary. Utterson is disturbed and concerned about his development, and makes an effort to seek out Hyde. This is instilled by Utterson’s fear that Hyde is blackmailing Dr.Henry Jekyll for his money.